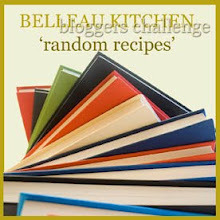 Over at Belleau Kitchen, dear Dom has challenged us with his usual Random Recipe teaser. However, in my haste, I misread the challenge and instead of choosing a recipe from a cookbook that I received as a gift last Christmas, I thought we were to choose a 'Christmas Cookbook'. Doh! I don't have too many Christmas cookbooks, just a couple of Delia's and the Home and Freezer books that I blogged about last week. 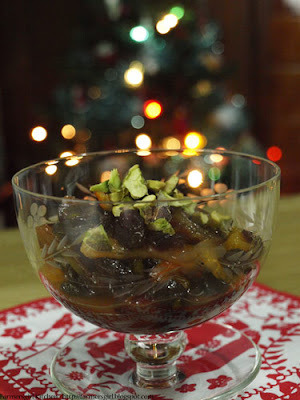 The original Delia Smith's Christmas was the one that came to the top of the pile and I opened it randomly and was delighted to find myself looking at 'Christmas Dried Fruit Compote'.This version of the fruit compote isn't on Delia's website, but I found it published in the Telegraph online. When I went to my larder, inevitably, I didn't have everything I needed for the recipe, so substituted some different dried fruits. No figs and no prunes, I could have sworn I had some prunes but must have used them in the instant mincemeat. 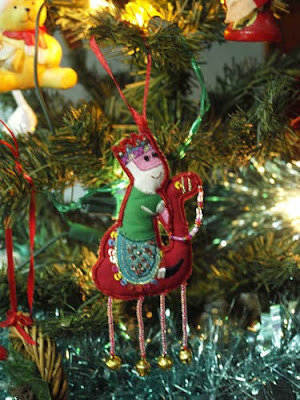 I had some lovely Medjool dates from the hamper I got from Olives from Spain and some dried mandarins and cranberries, all lovely Christmassy flavours. The original recipe calls for a liberal dose of Port, well my husband can't drink Port, it gives him migraines, so I used a couple of tablespoons of Amaretto, one of my favourite liqueurs. In the book Delia suggests that the fruit compote is served with flaked almonds, well I didn't have any of those either, so for this, by now VERY, Random Recipe, I used some nice green pistachio nuts to add to the festive colours. I made the compote last night and was sorely tempted to have some on my porridge this morning, but remembered just in time that it was full of booze and I had to drive into town to the hairdressers! We had it this evening served with Greek yogurt and it was delicious, would be great with vanilla ice cream too. All in all I'm rather pleased that I misread the challenge as I wouldn't have come across this recipe otherwise. 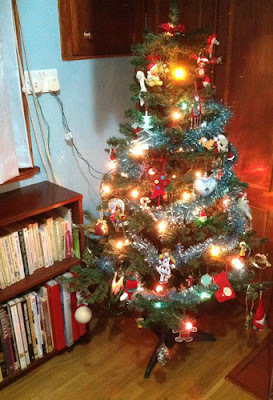 I put up the Christmas tree today, it lives in the kitchen between the cook books and the stove, and is decorated with an eclectic mixture of totally uncoordinated baubles and pretty things I have been collecting since 1980 when we bought our first flat, indeed the coloured lights were a flat warming gift from a friend and they are still working. I used the tree and lights as a background behind the first photo of the Dried Fruit Compote. In the spirit of the Random Recipe challenge, here is a Random Christmas decoration from my tree. Dom- glad it fits the remit one way or another, it certainly tastes good. Karen- yes, I remember that. Funny how the mind plays tricks on us, great results though! Now that's truly random. I like the addition of pistachios and Amaretto - it sounds like a lovely combination of flavours. Mind you, I rarely turn down port. Mmmmm one of my favourite Christmas recipes, I can remember making it before I had the book, having just seen it the day before on television. 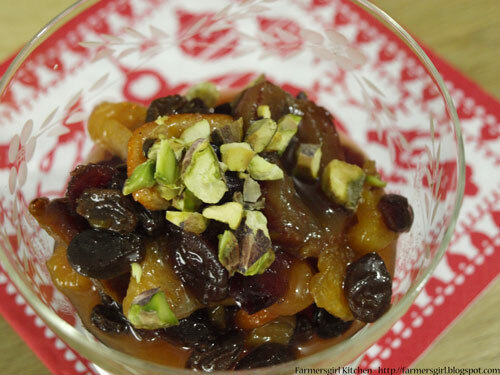 A compote is perfect to adapt and your changes sound delicious. 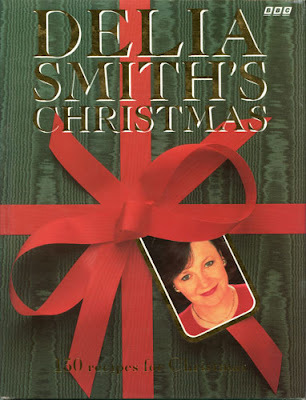 I really ought to invest in a copy of this book as I love Delia but don't have this one. I think I'd like some of this with yogurt for breakfast during the festive period. That sounds like a lovely combination of Christmas flavours - yum! Heehee, you'll have to try some on porridge on a day when you're not driving! I think your version looks better than the original, and more Christmassy as well. Ruth - yes, I must make it again and try it with the porridge! Sally - thanks, it certainly was delicious.